We herein report the development of a bromophenol blue(BPB)-silicone composite film/K+-exchange glass optical waveguide(OWG) sensor for the detection of amines produced during the spoilage of lamb. 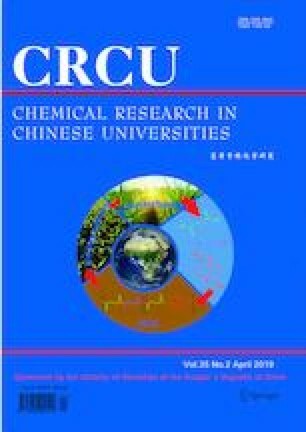 The optical and structural properties of the sensitive thin film were studied by ultraviolet -visible(UV-Vis) spectroscopy, and the light source of the OWG detecting system was selected. Gas sensing measurements showed that the sensor exhibited a good selectivity, high sensitivity, and short response-recovery time towards volatile amine gases in the 0.00117— 11.72 mg/g range. The as-prepared optical waveguide device was subsequently applied in the determination of gases (namely trimethylamine, dimethylamine, and ammonia) emitted from the lamb samples(5 g) stored at room temper ature( 25 °C) and in a refrigerator(5 °C) for 0—4 d, and the total volatile basic nitrogen(TVB-N) contents were detected by UV-Vis spectroscopy, and the results were compared with those obtained using our detector. It was found that the sensing element was capable of detecting mixed gases produced by the decomposition of lamb samples in a refrigerator for 0.5 h, where the TVB-N content was lower than 35 μg/g. Supported by the National Natural Science Foundation of China(No.21765021).